This is the final installment in a multi-part series about my training for Shadowboxing. For the first installment click here. 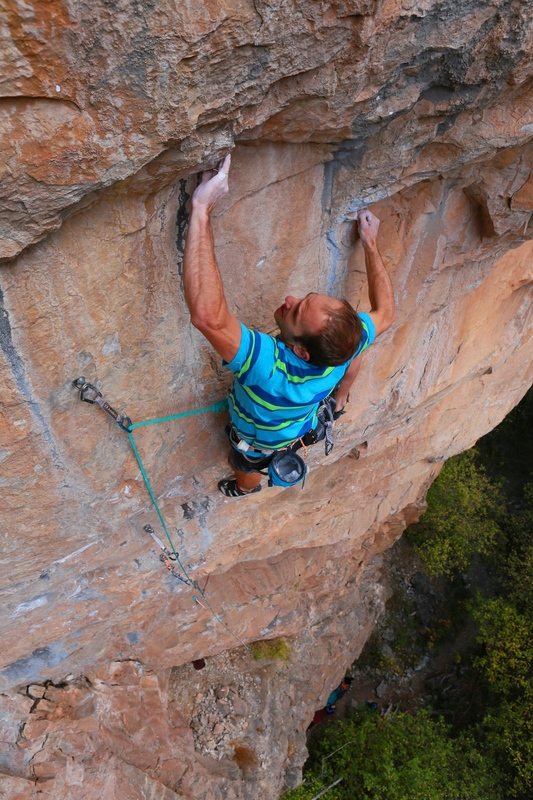 Wolfgang Gullich famously exclaimed “climbing is so complex!” after a winter of hard training failed to yield the desired results. Many factors need to come together simultaneously to complete a route truly at your limit (that’s one reason it’s often more productive to operate below your true limit, because it provides some margin for sub-optimal weather, power, skin, shoe rubber, fitness, etc). By the end of the May/June season I felt like I was capable of attaining the power and endurance needed to climb the route, but I needed them to better coincide. My power had come and gone too early, while my endurance arrived too late. This illustrates how difficult it is to perfect your fitness for a totally unique route when there are so many variables at play. After 15 years of practice I still managed to screw it up. The challenge is to optimize your physical ability for the moment when your technical knowledge of the route’s moves is sufficient to send. My friend Lamont Smith calls this “The Race.” Initially on a long project, your knowledge of the route, and ability to execute the moves is poor, but these increase steadily as you attempt the route more and more (eventually your rate of technical improvement slows and then stagnates, and then often reverses as resting for a presumed send takes priority over rehearsal, and you spend less and less time practicing the moves). As you learn the moves, spending more and more time on the rock, and less time in training, your physical power typically declines. Late in the campaign, as you approach technical proficiency on the route, your power may be rapidly fading. In order to “win the race”, you need to learn the moves well-enough to send before your power declines to the point that you can no longer execute them regularly. This is why I’m often willing to end a campaign when my progress stagnates—I know that when I return in the ensuing season, with tip-top power, the send will come much more easily. Obviously body weight, environmental conditions, and Power Endurance (PE) are enormous factors in The Race as well. PE generally improves throughout the campaign, improving as power fades. Environmental trends depend on how you’ve scheduled your season, and may or may not be in your control depending on other life factors. Ideally everything goes according to your plan, and your technical knowledge of the route, power and PE are optimized during a window of good weather. In June 2016, my timing was off. By mid-June I finally achieved sufficient technical knowledge and PE to send the route, but by then I no longer had sufficient power or suitable temperatures. However, that season and the previous taught me how to execute the moves and how to develop the power and PE I would need. I felt confident I would be technically able to send very early in the fall campaign, thanks to previous experience and copious film study. I could count on suitable and steadily improving sending temps. I just needed to re-vamp my early-season training so that my power and PE peaks coincided better. My approach wasn’t radical, I simply adjusted the timing of the Non-Linear Periodization strategy I had been using as maintenance training for the last several years. Typically at the conclusion of my Strength Phase I would complete a 3-4 week Power Phase (that included no significant PE training). 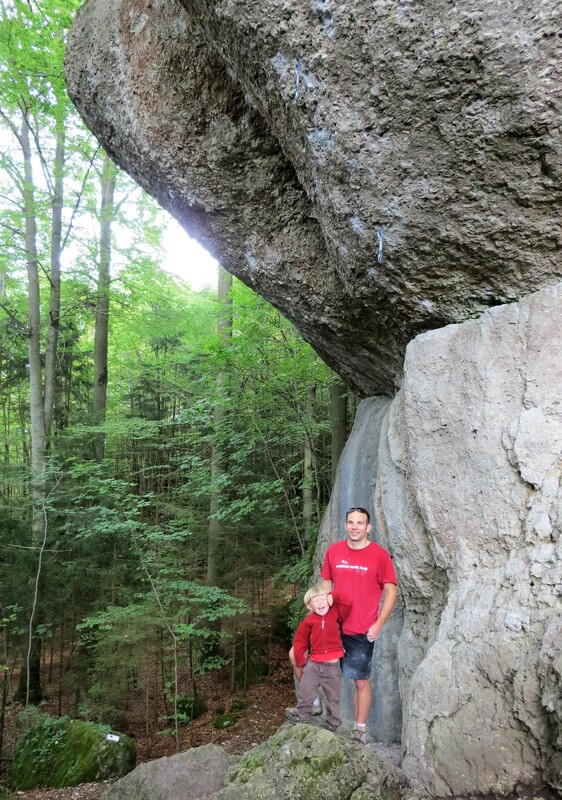 At the start of my PE/Performance Phase I would gradually introduce PE training following Limit Bouldering sessions. I experimented with moving this up slightly during the May/June 2016 season, and for the Fall 2016 season I began PE training just before the start of my Power Phase. Initially my Strength Phase was pretty much completely normal (ideally I would have started a few days earlier, but a work trip prevented that). The end of the Strength Phase and beginning of my Power Phase was quite unusual. I decided I wanted to be fit-enough to send by the second outdoor weekend of the season (23-25 September), and then backed out a PE training “start date” by analyzing my May/June schedule to estimate how many weeks it would take to get my PE up to standard. During that season, I got my first one hang 31 days after my first PE workout, so I scheduled my first Fall 2016 PE workout for August 26th, 30 days before September 25th and roughly three-quarters of the way through my Strength Phase. That first PE workout was just a primer (consisting of only one set)—an opportunity to see where I stood and re-learn the moves of the circuit, hopefully without digging a big hole that would undermine my remaining hangboard sessions. I planned to do my first full-blown PE workout the following week (on September 1), but bizarrely high humidity that dampened the holds in the barn prevented me from completing the first circuit. 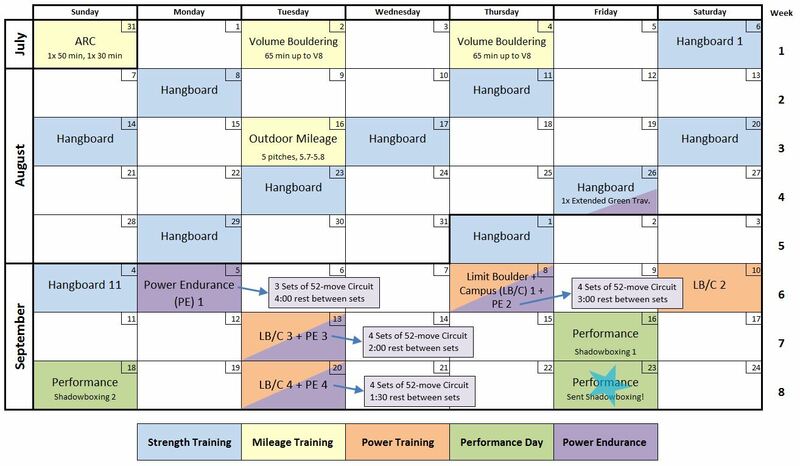 Instead I moved the workout to September 5th, the day immediately following my last hangboard session. Taken in isolation, that workout wasn’t spectacular, failing 50 moves into the third set with 4:00 rest-between-sets. In retrospect I should’ve been happy to do as well as I did less than 24 hours after a hangboard workout. I began my brief Power Phase three days later, including one NLP workout per week (consisting of the same activities and timing I used in May: warm-up followed by ~80 minutes of Limit Bouldering and Campusing (total), then finishing up with 3-4 sets of the 52-move circuit (and Supplemental Exercises)). I noticed immediately that my PE had hardly declined at all over the summer. As such, I was super aggressive in reducing the rest-between-sets from workout-to-workout—merely eight days after the first full-length PE workout I had slashed the rest period in half (to 2:00), matching my best effort from June! I dropped it again to 90 seconds the following week, just a few days before my target Fit Date. From a PE perspective, things went perfectly, but there is a downside to this approach. In my experience it doesn’t allow enough time, energy or focus to really improve power. First, you have to limit the length of your Limit Bouldering and Campus sessions so you have enough time and energy for the PE work, and second, you enter each subsequent workout a bit more fatigued than usual (from the PE training). These impacts make it difficult to advance during the power portion of the workouts (I feel like by the time I’m 100% warmed up, it’s time to move on to the next activity). Thirdly, power and endurance are mutually exclusive from a muscle-fiber-recruitment perspective, so training one will necessarily inhibit the other. In short, with so much emphasis on PE during the Power Phase, you’re fortunate to re-attain your previous power peak. For example, during September my first power workout (on September 8th) was excellent, probably my best first-power-workout-of-the-season ever. The next workout was lackluster, but the third workout (on September 13th) was stellar, easily among my best power workouts ever. I crushed many of the Lazy H’s testpiece boulder problems and matched my campus board PR on only my second try of the session. However, by September 20th I was complaining in my training journal that my left elbow was beginning to ache and I “didn’t seem to have a lot of pop.” I regressed in my bouldering and campusing, eventually cutting both activities short to save energy for PE training. Based on my experience, I wouldn’t recommend this approach for short-term power-intensive goals, nor for long-term power improvement. NLP works well for re-producing simultaneous peaks of various types of fitness, but it is far from ideal if you want to actually improve upon previous peaks. Had I not spent the winter and spring improving my PE peak, it’s highly doubtful I would have reached that level of fitness so quickly, and with so few sessions, in September 2016. Personally I think the winter/spring PE training was critical, and this approach would not have worked without it. The same goes for power—I already had sufficient power for the route when I first tried it in 2015, so each season I just needed to re-create that power, rather than reach a new level. This allowed me to sacrifice some effort in that area and re-direct it towards PE. The catch is that power-wise, I essentially coasted through the latter half of 2015 and the entirety of 2016. That is, my power did not improve at all for ~18 months as a result of this approach. That was a tremendous sacrifice, and generally not a wise one for the long-term thinker (although my strength, as measured by hangboard workouts, improved substantially over this period, so I may have a new reservoir of power potential to exploit during future Power Phases). Another oft-overlooked downside to NLP is that it takes a lot of time and energy. It’s exhausting and hard to sustain for more than a few weeks. If you want to experience that ambiguous phenomenon referenced by all training books known as “burnout”, try NLP for a while. It’s probably best left to youngsters with boundless energy and few serious commitments, and should only be used sparingly by grown-ups. In my view the type of NLP schedule described here makes the most sense for those who are near their lifetime peak, working a lifetime goal route with no margin, already have their route dialed, and are prepared to send in a short window. If you need to work out moves and sequences, you’re better off with a more typical periodization approach, at least initially. Once you feel you’re within striking-distance of a send, switch to NLP to get that last little bit of PE you need without neglecting power entirely. The other major risk in this strategy was that my Fall 2016 season was engineered to produce a very sharp, but necessarily very short performance peak. The entire season was an enormous gamble. I wouldn’t have 6 weeks of consistent fitness to work out sequences, wait for weather, or get my lead head in order. If I weren’t technically ready to send, or the weather didn’t cooperate, or I bobbled all my opportunities, I could count on my fitness crashing back down to baseline within only a few weeks. If I couldn’t capitalize on my fitness, I’d have to wait another 7 months to try again. Fortunately during the Fall 2016 season events unfolded according to my plan. On my first go back on the route I matched my previous highpoint. Aside from a bit of technical rust, it seemed like I picked up right where I left off endurance-wise, along with much better power. It still wasn’t easy, but I sent the route on September 23rd, one climbing day before my target Fit Date. It took every ounce of technique, power, endurance and effort I could muster to send it on that day. Was it worth the cost? That’s a great question…. So… Sounds like, ultimately, the changes you made in your training aren’t what you would recommend on a regular basis. Would it be accurate to say you didn’t necessarily improve any aspect of your climbing, but manipulated your training to get very specific results at a very specific time? Or do you feel like you did improve your Power Endurance while maintaining power and strength levels while training for the route? I would say the latter–I improved my PE while my other physical abilities stayed the same. Even so, I wouldn’t say I made a huge improvement in PE during any one season, but over the course of the four seasons (including Winter 2015/16) it improved dramatically. That’s pretty interesting, because I was under the impression that PE was transient and primarily related to muscle “fuel” as opposed to more lasting changes. Do you have any ideas on how physiologically the PE continued to improve from season to season?